[T]his month there were eleven spawning events at Landaa Giraavaru’s Marine Discovery Centre: two batches of Clark’s Clownfish and nine batches of Maldivian Clownfish (five living in the main aquarium and six inside the fish lab). We have increased our production of rotifers (zooplankton), so the larvae have plenty of available food from days one through six, before progressing onto the larger Artemia brine shrimp. The larvae that hatched on 24 June showed an excellent survival rate from day one to day six, and by day eight we had more than three hundred larvae still alive – our best result to date! [O]n 18 June our resident boxer shrimp in tank #33 gave birth to a few larvae. They have been kept separately with food and aeration, and after six days started to show signs of pigmentation – this is the first developmental stage and they will moult every six days for another five whole months before developing into adults. This month the seahorses have not given birth to any babies, but we have observed the pouch on the male to be somewhat enlarged, suggesting the presence of eggs or young offspring. This month we also have three new Maldivian Clownfish pairs and three new Clarks Clownfish pairs, and a beautiful Harlequin Sweetlips juvenile. [I]n Kuda Huraa, we are pleased to announce that one of our new saltwater tanks is now complete, and we have started to introduce numerous species into the aquarium. We are closely monitoring all our corals to decide which species will grow best under the artificial lighting system (photo, right). 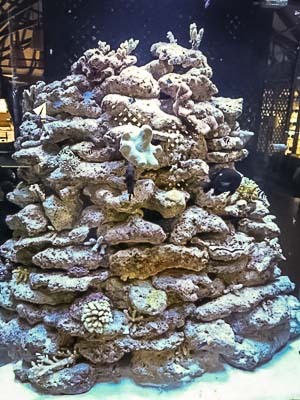 We would like to match the aquarium as closely as possible with the natural ecosystem, including lunar cycles and the low light levels associated with storms; we can do this using the controller for the LED lights. Once we have established healthy corals we can start to experiment with light levels to see optimal light intensities for various species.